Distinguished and bold, this heavy square ashtray makes a regal statement on any desk or table. Four roomy troughs, each measuring 1.25” by 1.5,” offer substantial support for any cigar. 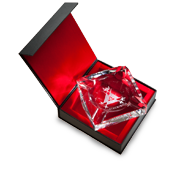 Crafted from the finest crystal, this classic style ashtray comes in a black presentation case lined in red velvet. Beautiful ash tray. It has a nice classic look to it and can fit in anywhere.